While our flag-making heritage is firmly rooted in the nautical arena, over time we have helped many different people, groups, shops or organizations create flags and banners for a wide variety of purposes. 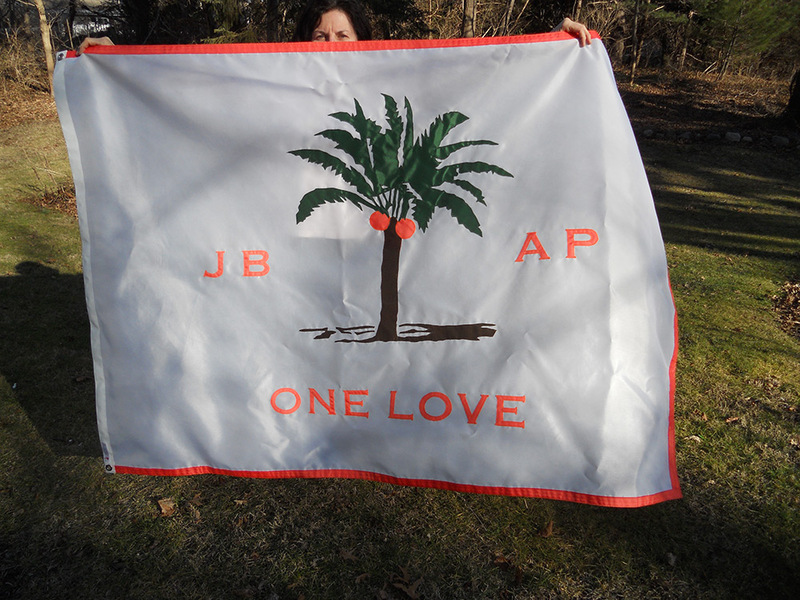 Whether you are looking for a boat burgee, a family reunion banner or an ‘open for business’ pennant, we can create a custom-made, hand-crafted flag that you’ll find to be both memorable and momentous. The ‘boat and butter’ of our business, we’ve made enough of these over the years that if you strung them all together you’d reach the Space Station (we have a flag up there too, but that’s another story). 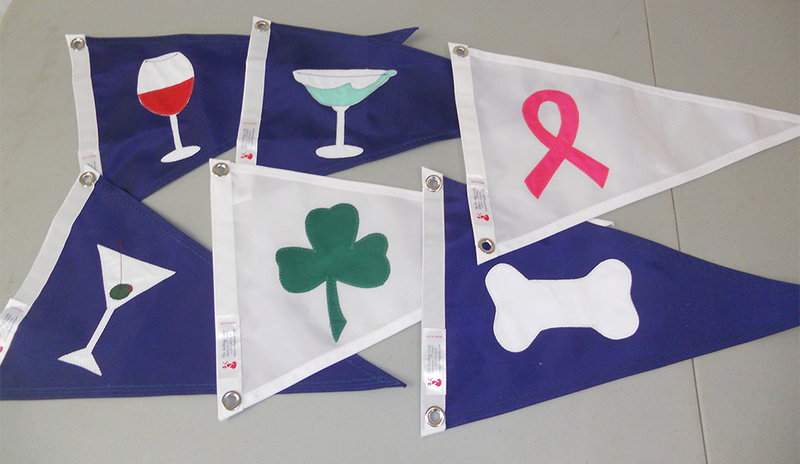 Have an idea for your own Boat Burgee? Well, get designing and we’ll make your idea into reality. Whether it’s a coat of arms, a family pet or your favorite sports team, we can create a long-lasting boat burgee from your rough sketch. You choose the color, shape, size and image and then let us do the rest. If you are looking for a pre-fabricated burgee, we have some of those in stock as well. The latest rage on the Racing/Cruising circuit is the Campaign or “Battle Flag”; these can make a bold statement either on your approach to the starting area or as you comfortably cruise in a favorite or new location. These flags generally fly on the forestay, so we cut a 28 degree slant in the forward edge, allowing them to fly straight back when hoisted on the angled forestay. The number 6 luff tape we add to the forward edge will feed into the jib track system although it may fly independently. 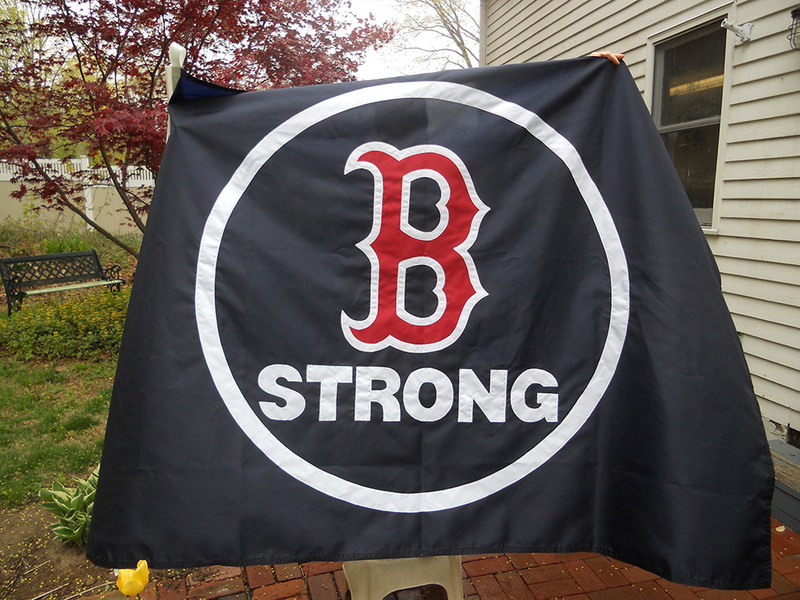 Substantially larger than a personal pennant, Battle Flags allow for a more detailed choice of logo. A powerful (warlike) image such as a mythical creature, or a funny cartoon character works well on a battle flag. Avoid “words” for your main battle flag design; they require a heavy, double thick flag to reverse the lettering. Be creative! 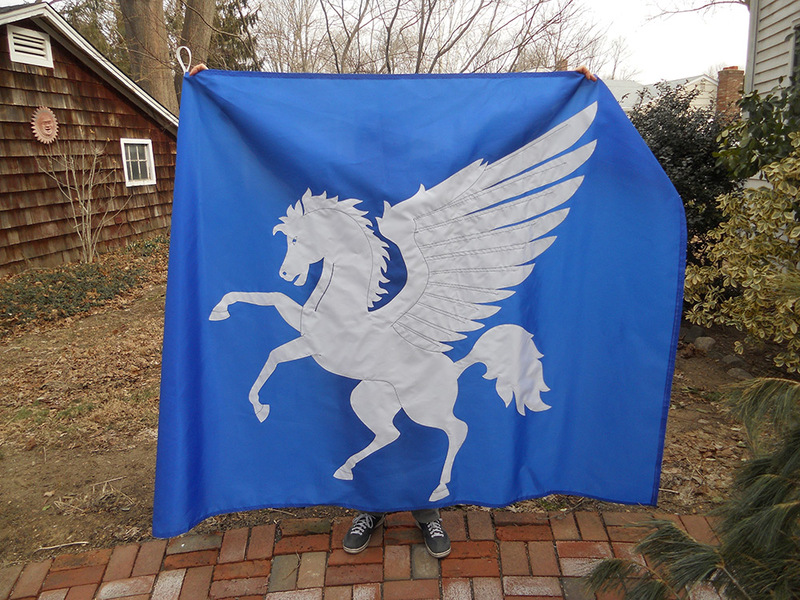 The creativity customers have shown in their Battle Flag designs is truly amazing. There is nothing we love more than a party! But making a flag, pennant or banner for a party comes in a close second. Customized, creative banners or flags can help make any wedding, family reunion, graduation or anniversary party even more festive and memorable. They make great gifts to mark the occasion as well. For inspiration, have a look at the gallery of event banners we’ve made for others. As you think about your design, notice that the simpler the message, the more impactful the banner. Create a sketch incorporating a logo, a few words and your color choices and we’ll turn your design into a wonderful flag or banner. While we are all about fun here at the Sailbaglady, we also know a thing or two about big business and impactful messaging. Our corporate and business banners let you display your message in a vibrant and professional manner. 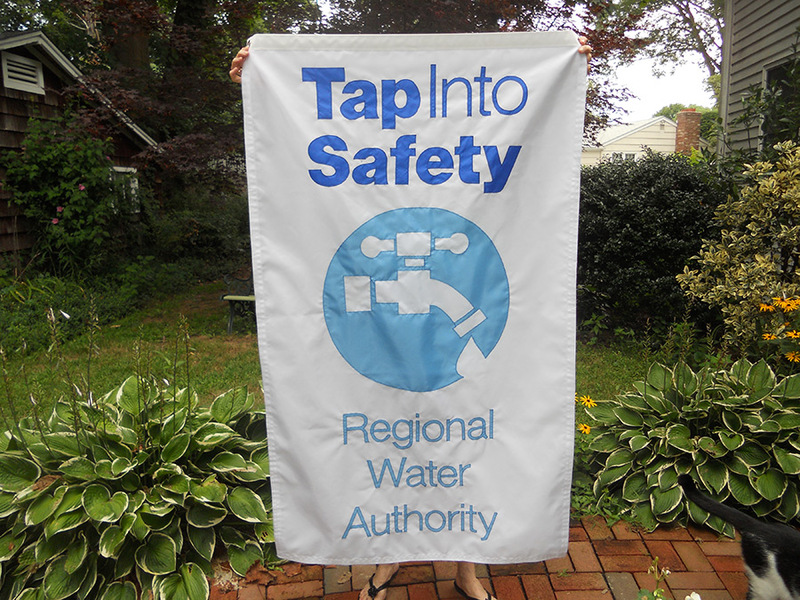 The gallery of banners we’ve created over the years provides a good idea of our capabilities. It may also inspire you or your designers as to what you need. If multiple banners of the same design are required, we’re happy to discuss volume discounts. If you provide us with a sketch or layout of your design, we can give you a quote and then quickly be on our way to making your business or corporate event both memorable and meaningful. Sometimes a tried and true design is exactly what you are looking for. 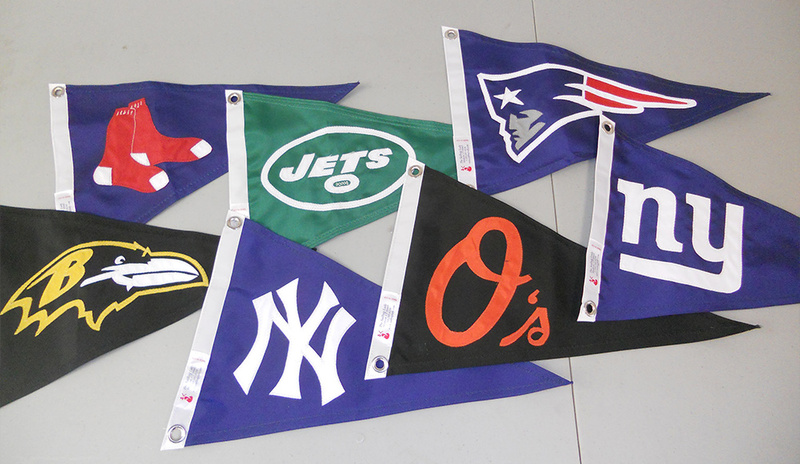 We stock a variety of pre-fabricated flags that are just right for certain occasions: the big game, St. Patrick’s Day, Happy Hour or going on a pirate raid. Like all the custom flags and banners we manufacture here in our Madison, CT flag loft, pre-fab flags are made right here in the US of A. Keep in mind that inventory varies so please email us to see if the flag you are looking for is in stock.